At first we were quite surprised by the skimpy room, but it worked really well. Not a lot of space to hang clothes-if you are ok with living out of suitcase. No coffee maker or refrigerator. Wonderful shower! All staff super friendly. Extremely clean. Close to Times Square. The location is great! Central Park, shopping, shows, and the subway, it is convenient to all these places. The reception and rooms are nice and the staff was friendly. We stayed for 6 days and our room(king bed) began to feel small by the end of our stay. Good location. Friendly and helpful staff. Rooms were comfortable. Good location. Centrally located. Access to subway. I liked the convenience of the location right next to Times Square, Broadway and tour busses. The room was clean but a little small. We had to unplug the clock to have two outlets for charging our phone. (It had only one outlet). "The city that never sleeps," New York lives up to its nickname with exciting diversions 24/7. Whether you're ready to experience the thrill of a Broadway show or you want to step into the shoes of the many immigrants who began their lives in New York with a visit to Ellis Island, the Big Apple offers both opportunities and countless more. The USA's largest city, New York is made up of five distinct boroughs: Manhattan, Bronx, Brooklyn, Queens and Staten Island. Each district has a unique personality and features all its own, but most visitors gravitate toward Manhattan: despite being just 12 miles long and three miles wide, this central district offers plenty of action for all age groups. Exploring other areas couldn't be easier, either; just hop on board a bus or subway line. Overall, NYC has the advantage of being seriously walkable, but also boasts a reliable and well-organized public transit system. No matter where you stay when you're in town, there's a good chance you won't be too far from the action. The vertical power of this city is nearly overwhelming. Only like New York embodies the golden era of skyscrapers, and eight of them became the tallest in the world at different times over the course of the 20th century. Get a bird's-eye view of New York with an elevator ride up the Empire State Building, or try less-crowded but equally impressive Top of the Rock. This observation points extends over the 67th, 69th and 70th floors of the Rockefeller Center, from which you'll find fantastic views of Manhattan, Central Park and the Empire State Building. When it comes to dining in New York, you really are spoilt for choice. Little Italy and Chinatown are packed with authentic eateries, while popular all-American diners like Stardust serve classics like Brooklyn Bagel, burgers, crispy wings and nachos. Finding the best bagel in New York could easily become the ultimate quest during your time in the city; take a look here to find some of the potential nominees. If celebrity-spotting is at the top of your menu, check out Serendipity 3 on East 60th Street. Legendary for its "Frrrozen Hot Chocolate" dessert, this hotspot is always bustling and often sprinkled with some famous faces. Mesmerized by the bright lights of Broadway? Make sure to book theater tickets in advance and if you're not too picky about the production, you might even score seats near the stage at discount prices. Just ask the box office staff if the show has a daily ticket lottery system in place. From Wicked to Phantom of the Opera to Chicago, you could be watching one of the biggest shows on the planet when you're in town. 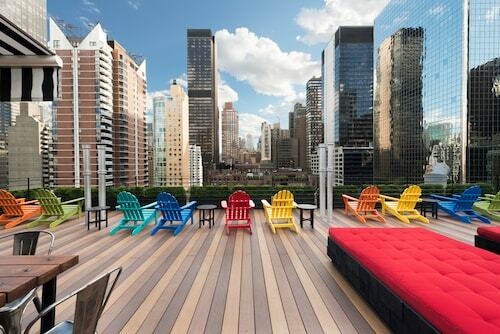 If you're itching to stay in the heart of the city, look no further than Manhattan's Uptown. Its northernmost clime is home to the Guggenheim Museum and the Met, Greenwich Village, Central Park and a revitalized, culture-drenched Harlem. It goes without saying that NYC's most exclusive hotels are in Midtown: the New York Marriott Marquis (right on Times Square), The Peninsula New York (Fifth Avenue), Doubletree Guest Suites (Times Square) and the Carlyle (Madison Avenue). The famous lights of Broadway are only a cab or subway ride away, and affordable Midtown stays are also available: take a look at our Budget Big Apple guide for all the Manhattan tips you need. A city within a city, Manhattan's lower precinct is made up of world-famous areas such as Chinatown, Little Italy, Wall Street and the resurrected World Trade Center. Soho's fashionistas, Tribeca's celebrities, and the East Village's culinary delights also make downtown truly cosmopolitan. Close enough to the Manhattan buzz, but with a laid-back feel, Brooklyn is a borough where you can experience echoes of New York from days gone by, while enjoying the hippest crowds, trends and venues. 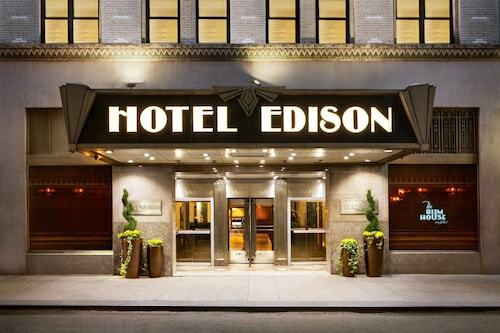 Here you'll find hotels to suit a wide range of budgets and tastes. Just across the East River from Manhattan, the New York Marriott at Brooklyn Bridge is a gateway to both Manhattan and the heart of Brooklyn. Close to McCarren Park, the uber-cool King and Grove Williamsburg is the first full-service lifestyle hotel in Brooklyn. On Dean Street, The Missing Lantern offers the kind of affordable rooms that make Brooklyn a prime option for those traveling on a budget. The staff was very friendly and informative. My room was really nice and clean.